Civic activists say they are no longer just waiting around for elected officials to agree on desperately needed Metro funding — instead they are educating and empowering citizens to lobby and to advocate for the funding. 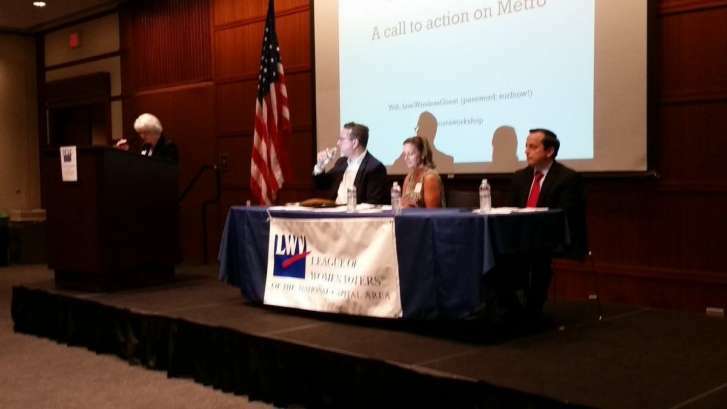 ARLINGTON, Va. — A grass-roots effort is underway to push for dedicated funding for Metro. On Saturday in Arlington at the National Rural Electric Cooperative Association, the public was invited to a Metro “Fund it and Fix it” call to action forum. It was organized by the League of Women Voters of the National Capital Area (LWNCA) and the Coalition for Smarter Growth. The panelists — Director of Strategic Planning at WMATA Allison Davis, Northern Virginia Transportation Commission Executive Director Kate Mattice and Metropolitan Council of Governments Executive Director Chuck Bean — shared their knowledge of Metro at the forum. Edith Snyder with the League of Women Voters is co-chair of the Metro “Fund it and Fix it” committee. The forum is a way to put pressure on area leaders to act to secure dedicated funding for Metro, she said. “To stop kicking the Metro can down the road and to really help ensure that the Metro is sustainable and reliable long into the future,” she said. Kathy McGuire, LWNCA president, said the future of the region depends on Metro. Snyder said she hopes those who attended the forum walk away with information that will allow them to contact their elected officials regularly to advocate for dedicated funding for Metro. “We want them to feel comfortable doing that whether making phone calls, writing letters or going to visit elected representatives to talk about this issue and how much it matters to them,” she said. Most elected officials want to do the right thing, said Executive Director for the Coalition for Smarter Growth Stewart Schwartz. “They wouldn’t be serving if they didn’t want to make our region a better place. Our region is also complicated. On the other hand, we think they all need to step up. All three jurisdictions, no matter what party, no matter what parts of their states, they represent and support Metro,” he said. He added that the D.C. region would not be so successful if it weren’t for Metro. Also, local jurisdictions wouldn’t have the kind of tax base they have without Metro, he added. A funding solution into 2018 is an urgent need, he said. Snyder said some 40 years ago, LWNCA basically was formed because of Metro. “The League has supported Metro all along and is not about to abandon it now,” she said.